It might not appear so from this blog, but I'm a fairly harsh critic of my children. It's something I would like to change, I'd like to let go of my fear that if I don't constantly point out their shortcomings they'll somehow be ruined. I showcase their creations, which give me endless pleasure, here on this blog and I don't use this space to explore the darker side of their personalities, but darker sides exist, of course, and sometimes it can feel like I focus a lot on what they don't do, what they do badly, or the ways in which they could improve, rather than looking at the lovely people they mostly are. So it does give me special pleasure when I see them all work together, totally self-initiated and without any adult involvement at all. 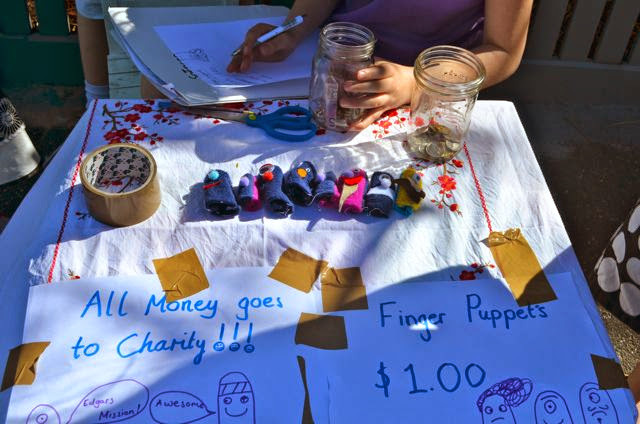 On this occasion they didn't even ask me if it was okay to set up a stall to sell the finger puppets they'd made, but they've done this sort of thing a few times so I guess they were on pretty safe ground. I especially like the packing tape they used and left on display on the pretty table cloth.